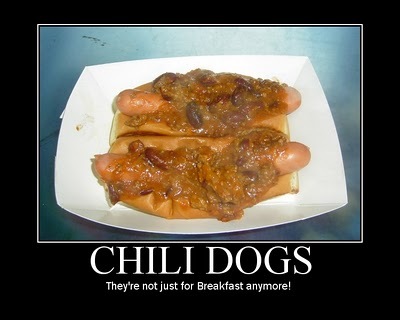 My chili dogs are famous around these parts. People come up to me on the street and tell me they LOVE my chili dogs. One day I sold 5 pounds of chili (that's a LOT) before 11AM! The record for eating chili dogs in one sitting is 7. The guy was a skinny dude-130 pounds tops and he WOOFED them down. In honor of the great chili dog, I made this motivational poster over at big HUGE Labs. Go there and make your own!